So there’s been a very important question about the Chevy Bolt that we’ve been following closely since its specs started trickling out earlier this year. How fast can it charge? 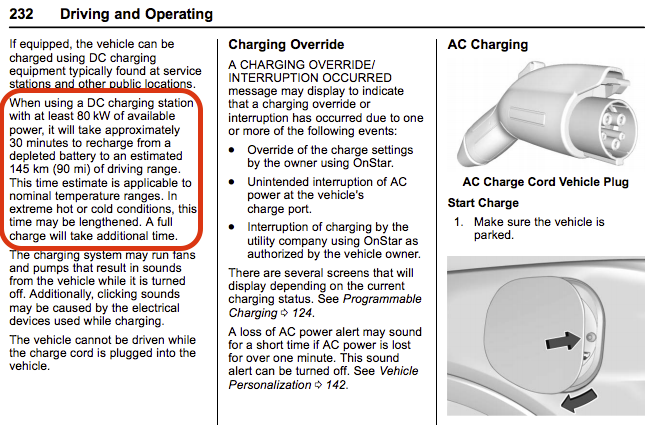 We’re not talking about Level 2/Home charging which was clarified this week at 7.68 kW. 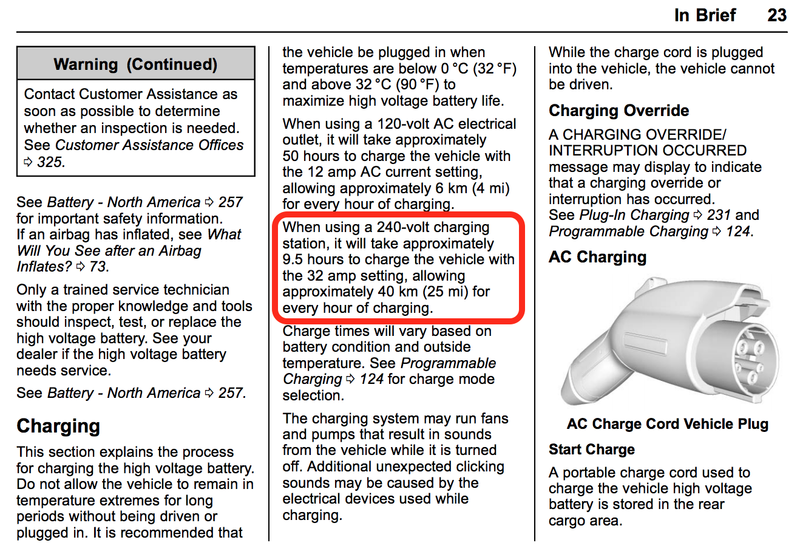 The Chevy Bolt Owner’s Manual which is now online (PDF) confirms that the Bolt will charge at 32 amps at 240 volts = 7.68 kW – giving the car 25 miles of charge per hour. This week, AeroVironment also announced that they would be providing the optional Chevy-branded home charging stations (vs. the included 110V plug adapter) to Chevy by upping their 30A EVSE-RS Charging stations 2 more amps to reach this level. As we’ve discussed before, this is a solid speed for home and destination charging but trails Tesla’s 48A chargers. The real world difference here in charging 100 miles is 3 hours for Tesla and 4 hours for the Bolt. Not a huge difference really when most of this will be done overnight. But the real question when we are talking about charging speed is DC fast-charging for long distance travel. There are a bunch of differing statements out there which say Chevy is going to include either 50kW or 80kW depending who and when you ask. So we’re getting mixed messages from Chevy. Let’s run down the data points. 90 miles in 30 min. 90 miles is 38% of the battery capacity or 22.7 kWh. 22.7 kWh in 30 min means an average charge rate of 45 kW, or really 50 kW with some charging losses. If it was actually charging at 80 kW, it should have gained 40 kWh in 30 minutes (2/3rds of a charge or 157 miles). In addition, Josh Travel, in the video below notes that an 80kW charging station will put the same 90 miles on in 30 minutes. Josh’s statement is meant to reflect that chargers above 50kW can deliver a sustained 50kW, the Bolt EV charge rate, across the session cycle and thus provide 90 miles of range in 30 minutes. The owners manual says – and Josh’s statements affirm – at least 80 kW to ensure the station supplies the current needed to reach 90 miles of range in 30 minutes. While many stations are 50 kW now, the Bolt EV is compatible with all SAE Combo DCFC stations as they come out, and charge currents into the battery are managed by the vehicle. After scratching our heads and asking around, we followed up with our math and have yet to get a comment back from Chevy. So will you be able to charge at 80kW and get a charge faster than the current 90 miles in 30 minutes quoted by Chevy? At this point, we’d have to say it is unlikely, at least at launch. If Chevy is indeed pushing 80 kW chargers to its dealers, perhaps it is doing so because future EVs, perhaps even updated Bolts, will be able to charge faster. The fact that 80 kW is in that video and the manual seem to indicate that at one point the Bolt was expected to be able to hit 80 kW but perhaps things started failing at the higher charge rate. Another scenario is that the hardware is there for launch but the software and safety testing isn’t complete for 80 kW. That kind of move isn’t unprecedented. Tesla has improved its DC Supercharging speed with over the air software updates in the past. Here’s the Aerovironment press release on the Level 2 charger. General Motors Company has named AeroVironment, Inc.’s EVSE-RS as the official charging station accessory for the 2017 Chevrolet Bolt EV. As an official accessory, AeroVironment’s 32A (a slight boost up from the 30A models in the rest of the EVSE-RS range) charging station will be labeled with its own GM part number and will be available through Chevrolet dealerships. The level 2 EVSE-RS can charge up to five times faster than standard cordsets and is easy to use, designed for indoor or outdoor operation and equipped with advanced safety features. It is rigorously tested beyond UL requirements to meet strict internal and external quality standards ensuring world class safety and reliability. Making its debut in California and Oregon late this year, the highly anticipated, all-electric Chevrolet Bolt EV features an EPA estimated range of 238 miles per charge. With a starting MSRP of $37,495, before available tax incentives, the Bolt EV offers double the range of existing EVs in the same price range.